A very reliable method for making a good homemade blueberry – or any other soft fruit – smoothie. Start with the smooth: a blended banana makes a very smooth puree – think baby food. The banana can be under-ripe, ripe or over-ripe. If my bananas have gone black I will peel them and keep them in the freezer and add to the smoothie in its frozen state. A blended mango has the same kind of smoothness and can be substituted. Add sweet and sharp: fruit is deceptively sweet – so needs to be offset with a little sharpness. A pineapple has both both sweet and tart tastes in one. Add some liquid: apple juice is the ideal liquid for a smoothie – it is sweet and tart and adds neutral fruit taste. You can use cranberry juice or other tart and sweet neutral flavoured juices. Cut back on the juice and add a very large spoon of yoghurt to make a refreshing yoghurt-based smoothie. 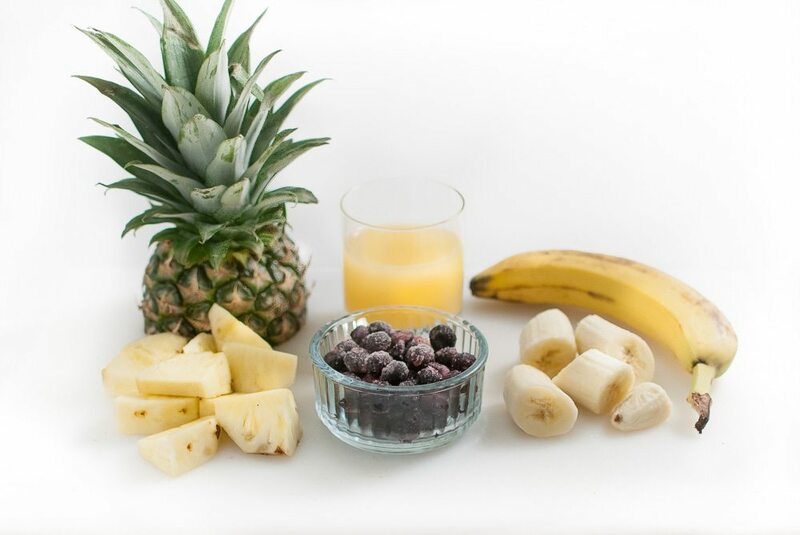 This is the base for any type of fruit smoothie – stop here for a very good banana and pineapple version. Otherwise add additional fruit. Add a flavouring fruit: I buy frozen blueberries from a local farm shop. Keeping frozen fruit is very convenient and also has the advantage of cooling the smoothie. Other flavouring fruits could include peach, strawberries, raspberries, blackcurrants, mango, or papaya. Experiment with other fruit – but avoid citrus fruit (which are better in cooler-type drinks, or combined with tropical soft fruit to make punches.) Apples and pears are best juiced first. Keep a routine: for one person I cut about 2 cm from the bottom of a pineapple and trim the peel and core. The pineapple then sits on a plate in the fridge. A large pineapple will keep for a week. I cut the banana in half and keep the remainder on the counter for the next day. A large slosh of juice and small handful of blueberries makes a 250ml smoothie. I’ve shown an example for smoothies for two people in the photo – the cut fruit in the top photo made a 250ml glass (Mr WDC) and 200ml glass (Mrs WDC) – shown in the photo below. NB: 250ml is the typical size smoothies are sold in single portion plastic bottles. Don’t super-size your smoothie: We should heed warnings about the dangers of eating large amounts of fructose via fruit drinks. Although fruit is good for you: when blended it is deceptively easy to consume more than the recommended amount. So drink smoothies in moderation!